Lang leve Apple’s text-to-speech, je kan altijd even een snelle check doen en hij is bijna altijd correct. Misschien wel iets om op de hoofdtelefoon te doen als je niet wil worden uitgelachen door vrienden of collega’s. Handige tool van de dag – Irradiated Software – SizeUp. Hiermee kan je op de Mac schermen met een toetscombinatie snel schermvullend maken of een half scherm laten innemen, erg handig & snel. Here’s a handy quick reference with common things you should know about Google+, like how to prevent a post from being shared and hotkeys for more quickly navigating conversation streams. 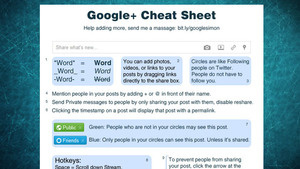 via Lifehacker, tips and downloads for getting things done. I’m now in the process of moving all blogs (older Geeklog, standalone WordPress installs, postnuke, phpnuke, drupal) into this new shiny WordPress Multisite setup. My photogallery has been the biggest challenge, due to its sheer size. 27000 photo’s is not an easy conversion at the best of times. Luckily, Gallery 3 has been proven solid so far and I’m looking forward to using the new features. Unfortunately, the stock PHP is pretty barebones and can trail behind the newest releases. Specifically, the open-source CMS/Weblog/ImageGallery stuff I use requires some common PHP extensions not included in the stock install, and the site is unbearably slow without some kind of caching PHP-accelerator. This post details my setup procedure, mostly as a reminder for myself. Historically, I have used the PHP compiled by Marc, which has been excellent, with the internal Apache and MySQL. By manually installing either eAccelerator (before 2009 or so) or APC the speed was pretty good too, even on the wimpy iMac G3 this site used to run on. Unfortunately, current releases, as produced by the guys over at Liip, do not work on my 32-bit Core Duo based server. This has pushed me to consider manually adding the required extensions and APC to the “stock” Apple PHP 5.3.4. Going “Stock” has the benefit of automatically receiving updates along with the OS X updates, and I definetely have not missed manually updating MySQL or Apache. A potential problem is that some extensions might require a recompile should Apple decide to move to a new verson of PHP. And then now, on to the actual reason I started this post; the steps required to install these PHP extensions, as a reminder for myself mostly. A working install of the Mac OS X Developer tools is presumed. This should enable APC and leave you with a working setup! If you must use Mcrypt, this requires compiling from the PHP source code. This is much more work than a simple extension install through PECL…. Check phpinfo() to see if both mcrypt and APC are now functioning, and all should be well! option: Geeklog migration to a WordPress multisite setup, a Gallery 3 plugin for WordPress is available. Q: Werkt de Garmin Edge 800 met een Mac? Werken de kaarten ook, dus kan ik de DVD gewoon in de Mac stoppen en dan kaartdelen aanvinken en uploaden? Ben je zeker dat je de kaarten niet eerst op een Windows machine moet ‘unlocken’? Dat was een tijdje geleden wel nog zo. Qua training software vind het de Garmin Training Center meer dan voldoende, zeker samen met de online “Garmin Connect” site.